Thank you for your interest in volunteering with the Museum. All volunteer positions are currently full. Please check back for updates. 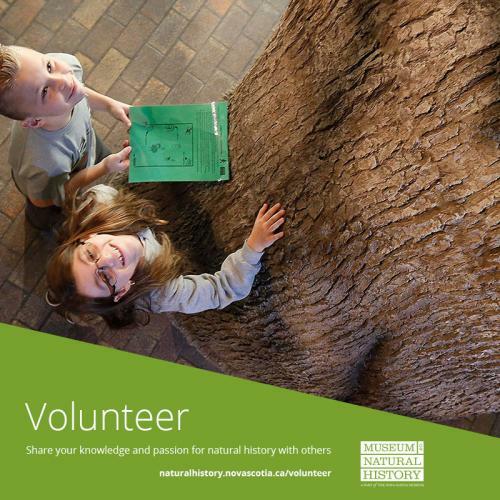 Share your knowledge and passion for natural history with others! The Museum of Natural History depends on the contributions of our volunteers. Elementary education programs, gallery programs and special events are only possible with the help of volunteers. If you are looking for career development, teaching opportunities, museum experience or interaction with people, then join our team of volunteers. Join the Museum of Natural History’s volunteer team as a School Program Instructor and work with elementary students in an interactive, educational setting! Volunteers gain experience in public speaking, working with youth, and working in a museum, as well as knowledge of Nova Scotia’s natural and cultural heritage. Volunteers are also able to expand their network of professional contacts and attend special events. Volunteers are required to commit to one fixed morning a week for a period of 3 months (April, May and June). Volunteers who facilitate our education programs must be 18 years of age. Training is provided for all educational programs. Gain experience working in public speaking and museum interpretation.